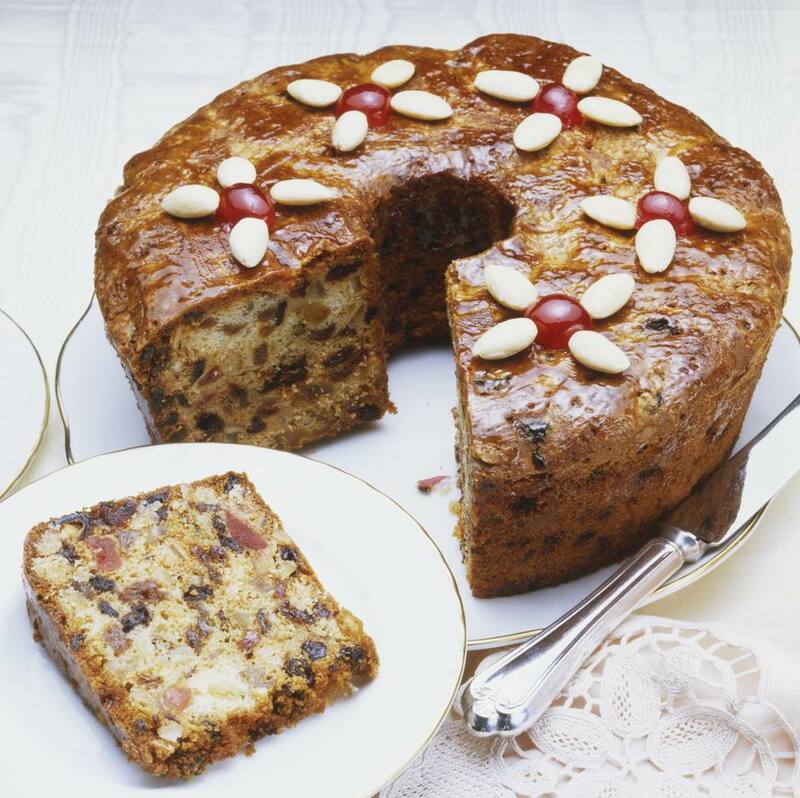 This fruitcake is filled with a number of dried fruits, including candied cherries and pineapple. Chopped pecans add crunch to the fruitcake, but feel free to use walnuts instead. Dried cranberries, chopped dried cherries, and or dried blueberries may be used to replace some of the raisins. Combine fruits and nuts in a large bowl. Pour brandy over and cover the bowl tightly. Let mixture stand overnight or up to 48 hours. Grease two 9-by-5-by-3-inch loaf pans and two tube cake pans (or use more loaf pans). Grease a sheet of foil or parchment paper and line the pan. Beat butter until light and creamy. Beat in brown sugar until mixture is light and fluffy. Beat in eggs a few at a time, beating well after each addition. Beat until well blended. Sift together the flour, baking powder, soda, and spices. Stir lemon and orange juices into the creamed mixture, then stir in flour mixture. Transfer batter to a very large pot or bowl, large enough to hold batter and all fruits and nuts. With a long-handled wooden spoon, stir in fruit and nut mixture, along with the brandy which has not been absorbed. Blend thoroughly. Turn the batter into the prepared pans. Bake in the preheated oven for about 3 hours, or until a toothpick comes out clean when inserted into the cake (not into fruit). Cool the cakes in pans on racks. When cool, remove them from the pans and carefully peel off the foil or paper. Wrap the cakes in cheesecloth and sprinkle generously with more of the brandy. Seal cakes the in food storage bags or plastic wrap. Brush cakes once a week with more brandy and then reseal. These fruitcakes should be mellowed for at least 3 weeks. The fruitcakes can be frozen after that amount of time.